I think this quote can be applied to most days of our lives, but it certainly does not on the day you run a marathon. January 13, 2008 was a remarkable day and one that has impacted my life in a way I never expected. This was the date of my first marathon. Fast track to the present and I have since taken on the distance 22 more times. Each marathon I've participated in holds a special place in my heart, but some stand out among the rest.... and it's these stand out ones that I would like to share with you all in this post. 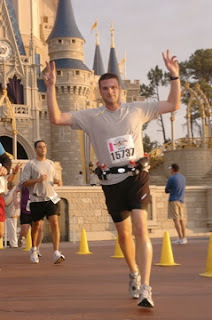 So, back to January 13, 2008 and my first marathon, the Walt Disney World Marathon. I remember being overwhelmed with emotion right before the race started. Sandwiched in my corral among my fellow runners, sun still waiting to show its face, I reflected on the 4 months of training that prepared me for this day. I couldn't believe it was finally here. This was it! I was about to take on something that I once thought was only reserved for the most elite athletes! The marathon lived up to everything I expected it to be and more. 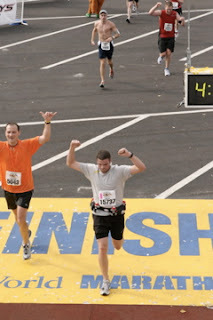 When I crossed the finish line (in 4:27:08), the sense of achievement I felt was unreal! I was able to call myself a marathoner! I remember calling my mom shortly after I finished and she must of thought I sounded like death. The pain I was experiencing in my body was down right awful! It was the hardest thing I had ever done in my life. I think my face tells it all! It didn't take long for me to sign-up for my next marathon. Once the Chicago Marathon opened its registration for their 2008 race, I quickly made sure I secured a spot in the field. I couldn't of picked a better location to run my second marathon. If someone asked me to recommend a marathon, Chicago would certainly be at the top of my list. The whole city of Chicago embraces this run and on race day, millions of spectators line the streets to cheer you on. It's quite a rush! 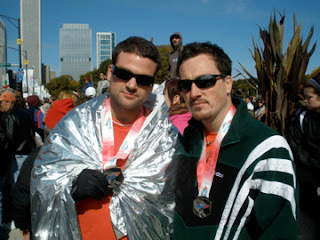 The following year I ran in the Chicago Marathon again, but with some company this time. In 2008, my good friend Marker had come out to watch me run. On the train ride back after the race, he told me that he wanted to run it next year. 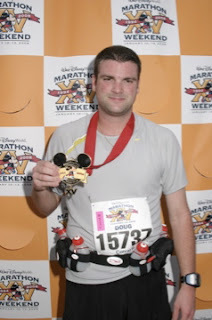 So, in 2009, I got to share my 5th marathon experience with Marker at my side. It was special moment for me when we crossed the finish line together. I knew the affects finishing a marathon has on a person and I was excited to watch Marker experience them. I can't always be serious! 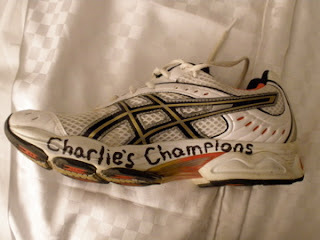 The 2009 Chicago Marathon was also a memorable run because I was also running for a cause. For this race, I raised money for a great foundation, Charlie's Champions. Charlie was diagnosed at the age of 6 with acute lymphoblastic leukemia. After battling this cancer for 6 years, I'm happy to report that Charlie is cancer free! In fact, I finally got the chance to meet Charlie and his parents in person last month. Charlie is doing great and he is keeping himself busy with many summer activities! I strongly encourage everyone to visit his website to learn more about him and the foundation, http://www.charlieschampions.com/. He is a true hero and an even bigger inspiration! 2010 was a special year of marathon running for me. The 12-in-12 Challenge was an amazing journey that allowed me to experience so many great marathons. 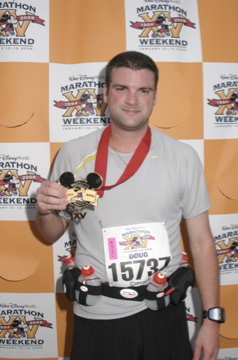 In April, I ran in the Garden Spot Village Marathon in New Holland, PA, which is just east of Lancaster. The course was quite beautiful, weaving through the vast farm land in this area. The scenery reminded me a lot of my hometown in Indiana. The Amish community is large in this region and witnessing their lifestyle was very interesting. I remember that so many families sat out in their front yards to watch us run by. This was a pretty small marathon and most small marathons don't close the course to traffic. However, instead of sharing the road with cars, I was sharing them with horse-drawn buggies. Pretty cool! Another highlight during the 12-in-12 was running in my first international race in Montreal. The Marathon de Montreal was a first class race. The field size was not too big, not too small. 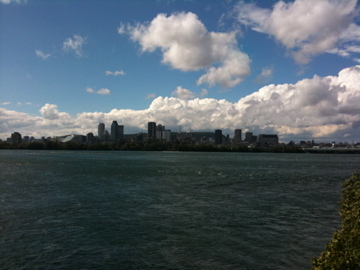 The Canadian hospitality was fantastic and Montreal is an absolutely gorgeous city! The coolest part of this race for me was that a section of the course went around the Circuit de Gilles Villeneuve, home of the Formula 1 Canadian Grand Prix. If you know me well, you know that I'm a diehard F1 fan. So, to get the opportunity to run around such a historic race track, where drivers such as Senna, Prost, Mansell, and Schumacher have driven, was real special. Another trip to run in the Marathon de Montreal is certainly in my future! During the 12-in-12, I ran with two people running their first marathon. My brother Matt joined me in my May race, The Long Island Marathon and my good friend Katie joined me in my October race, The Marine Corps Marathon. Much like my experience with Marker, it was great to see Matt and Katie run their first marathon! Certainly, the highlight of the 12-in-12 was getting the opportunity to run in the New York City Marathon. Behind Boston, the NYC Marathon is one of the most prestigious marathons and attracts some of the best runners from around the world. The full realization of running in the NYC Marathon didn't sink in until the first mile. Crossing the great Verrazano-Narrows Bridge at the start, I had a spectacular view of the NYC skyline off to my left. It looked so close, yet, so far. It really gives you a full appreciation of the marathon distance. The course takes you on such a great tour of all five boroughs of NYC. Like Chicago, the whole city comes out to watch the race. The best part of the course, in my opinion, is the run up First Ave. in Manhattan. The amount of people that line this part of the course is insane! Overall, an EPIC marathon to run in! Time was not important to me during the 12-in-12. Finishing each marathon was my only goal. However, that mindset changed in 2011. Coming into this year, my best marathon time was set back in May of 2009 at the Delaware Marathon (3:57:59). It was time to take on my current PR! 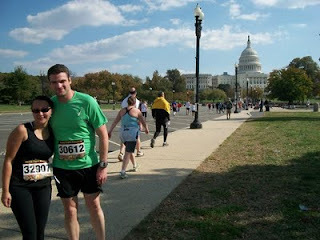 In February, I ran in my running club's (DC Road Runners) annual marathon, the George Washington Marathon. 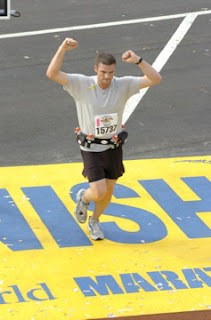 When I crossed the finish line, I had beaten my previous PR by a mere 17 seconds! The course for this marathon was pretty hilly, so I knew that the potential was there to beat my time again. One month later I ran in the Shamrock Marathon in Virginia Beach. For this race, I had one goal and one goal only, set a new PR. Race day conditions for the Shamrock Marathon were perfect. I knew that if my legs had it in them, it was going to be a good run. I started the marathon off at a pretty conservative pace, averaging about a 9:15 minute mile pace for the first half. Running a marathon is all about pacing yourself. If you go out too fast in the first half, the second half is going to be hell (a mistake I've made one too many times). Take it from me, it takes a lot of discipline to hold back at the start, especially when it seems that every other runner around is flying past you! Once I reached the halfway mark, it kicked it into another gear and took off! Each mile I got progressively faster. By mile 21, I was running 8:30 minute miles (and blowing past every runner that passed me at the start!). By mile 24, I dropped it down to an 8:15. Once I hit mile 25, I pushed myself as hard as I could. I left nothing on the table and clocked my 26th mile in 7:44! The last 365 yards were a complete blur. I had developed some wicked tunnel vision and the only thing I saw was the finish line. I finished in 3:54:20 and I was absolutely STOKED! I had just run the best marathon of my life and I felt great! For me, that's what marathon running is all about.... putting yourself on line, giving it hell, and hoping you can make it to the finish strong! Most marathoners, like myself, have become addicted to this distance. Are we crazy?... far from it. We are just doing something that brings us an immense amount of joy and happiness to our lives. I believe it is only human nature that us marathon maniacs continue to run race after race. To us, life wouldn't make sense without it!